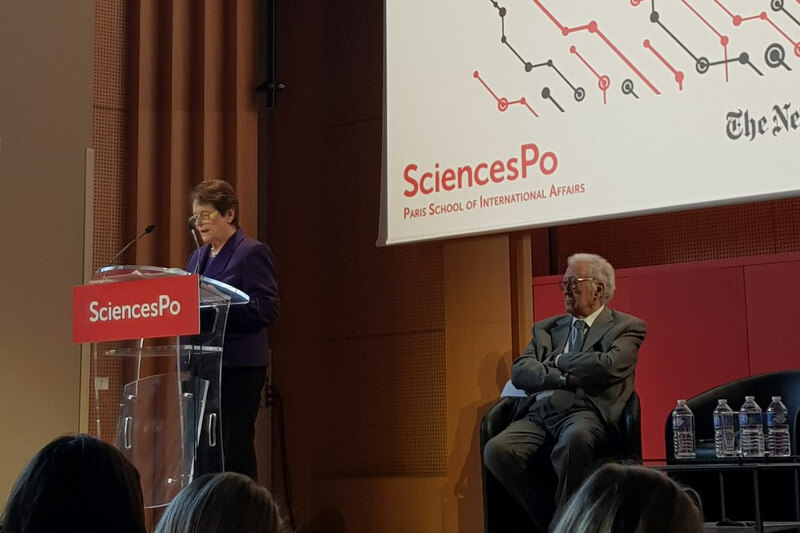 Gro Harlem Brundtland addressed the Youth and Leaders Summit at Sciences Po on the benefits and challenges posed by new technology to healthcare, climate change and democracy. It is a privilege to be with you here today for the Youth and Leaders Summit to discuss such an important topic, which is relevant to so many pressing social, economic and political issues of our age. It is also a privilege to speak here at such a distinguished institution where Prime Minister Enrico Letta has given new inspiration and dynamism. It is a particular honour to be at this session dedicated to the life and memory of my dear and dearly-missed friend Kofi Annan. Like Lakhdar Brahimi, I had the privilege of working with Kofi for decades – at the UN, where he offered invaluable support when I was Director-General of the World Health Organization, and then as members of The Elders as we continued to work to support peace, justice and human rights across the globe. Lakhdar has already spoken so eloquently about Kofi’s remarkable life and the contributions he made to the causes he held dear. Whilst preparing this speech I kept thinking of how seriously and importantly Kofi treated the issue of new technologies and the implications of their use for peace, development and human rights. One of his watchwords was “you are never too old to learn, and never too young to lead”. For me, this sums up perfectly the attitude that people of my generation, and the generation of leaders currently in power, need to adopt when considering the vast array of new technologies at our disposal. We need to show the humility to learn and be receptive to new ideas and platforms, rather than sticking to familiar if outdated methods and processes. One of the biggest challenges in the decades to come will be how we secure equal access to education, not only in the key formative years of youth, but throughout life. As Thomas Friedman of the New York Times put it, we live in the "Age of Acceleration", confronted with three simultaneous processes of change; from digitalization, globalization and climate change. We need to adapt and relearn again and again. We need to listen to young people such as yourselves who have grown up in the digital age, and understand how you use these new technologies, the benefits they can bring to society, and the innovation and creativity they can inspire in individuals and institutions. At the same time, we need to carefully consider every aspect of the “disruptive” elements of these new technologies. Although these are not words you might usually hear from the podium of a lecture hall in a venerable university such as Sciences Po, being “disruptive” does not necessarily mean having a negative or distracting influence. New technology can be disruptive in the sense that it can break down barriers and monopolies, empower people who may previously have been disenfranchised, and extend the reach of communications platforms to make them more interactive and responsive. This is certainly true in two areas that are particularly close to my heart and to which I have dedicated so much of my engagement in public life: health and climate change. These two issues require the holistic approach that we see under the umbrella of sustainable development. This is the best way of meeting the basic needs of all and securing equal opportunity, dignity and human rights for all. And for both health and climate change, technology can help advance a progressive agenda when it is applied in a transparent and responsible manner. The link between health and technology has been fundamental to the development of medical science and public health for centuries, from the ground-breaking discoveries of Edward Jenner and Marie Curie to modern techniques of computer-aided surgery and non-invasive treatment that would have been unthinkable even five or ten years ago. 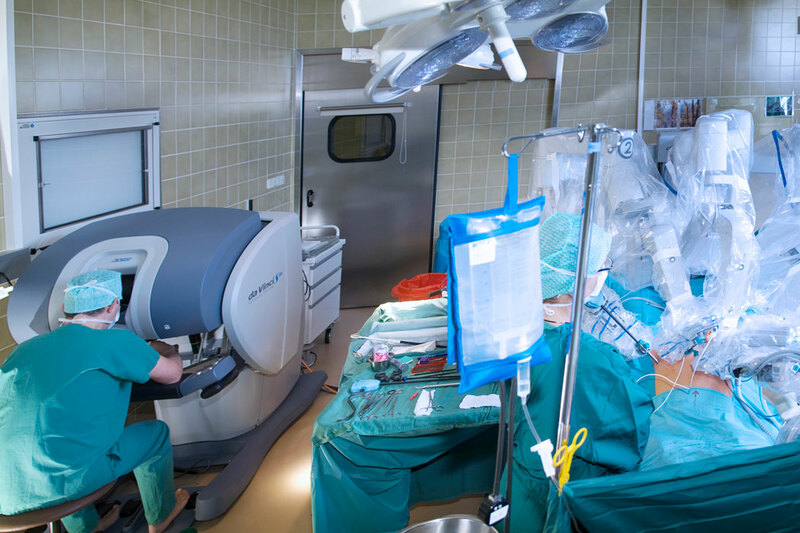 Artificial intelligence, robotics, automation, virtual reality and drones are all driving innovation in areas from diagnosis and monitoring of conditions to surgical interventions and wider pastoral care. The rapid growth of mobile and specifically smartphone use in the developing world means people have far greater access to health information and can more easily contact medical services. This is critically important, especially for women and for many marginalised communities. However, we must remember that technology, however innovative or disruptive of past practices, is not a universal panacea. 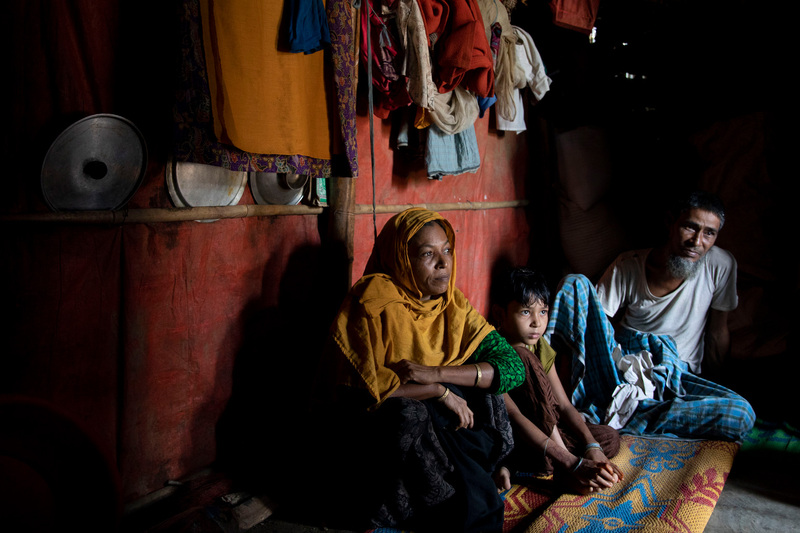 The key to improving health access and outcomes remains: politics. Without the political will to confront vested interests and increase public funding, decent healthcare in many countries will remain the preserve of the rich and privileged. Even in the United States, the richest country on Earth and home to some of the most skilled medical institutions and practitioners, 30 million people still live without basic health insurance and face crippling poverty due to medical bills. Technology alone will never address these fundamental inequalities, which are born of deliberate political choices and priorities. The test of our political systems will be our ability to make technology work for all and not only the privileged few. Last year, I travelled to India with Ban Ki-moon as part of The Elders’ initiative to promote Universal Health Coverage. India is a country undergoing rapid and disruptive technological, social and economic change, and all of this has consequences for the future of its public health policy. But the most impressive development we saw was a small neighbourhood clinic in a poor district of Delhi, where doctors deliver basic services free of charge to local residents. These so-called “Mohalla” clinics have been set up by the Delhi State Government and do an excellent job of increasing basic service provision and realising poor citizens’ right to healthcare. Surely, this model is more “disruptive” – in the positive sense of the word – to old orthodoxies and assumptions than even the most innovative technological breakthrough? Gro Harlem Brundtland and Ban Ki-moon visit a Mohalla clinic in Delhi in September 2018. By the same token, it is clear that harnessing the potential of new technologies is an indispensable element of the fight against climate change. Without bold and disruptive thinking, the world will not be on track to meet the targets of the Paris Agreement on climate change and the wider Sustainable Development Goals. We will simply need both disruptive technologies and disruptive politics to move forward, as we share the burdens of transition much more fairly. From ever-more efficient development of renewable energy sources to the prospects of prosperity, jobs and energy security offered by cleantech industries, technology can take the lead when politicians fail to show the necessary courage, or remain beholden to the corporate interests of the fossil fuel lobby, also inspired by a growing demand from employees and consumers that businesses and companies use their moral as well as economic voice as they pursue sustainability. Geoengineering has the possibility to help us contain climate change, but could have unforeseen and unintended consequences. We do not know yet what the impact will be on global ecosystems and particularly on those regions and communities already vulnerable to climate change. If we are to pursue forms of geoengineering, then a transparent, participatory and accountable international governance system needs to be established. 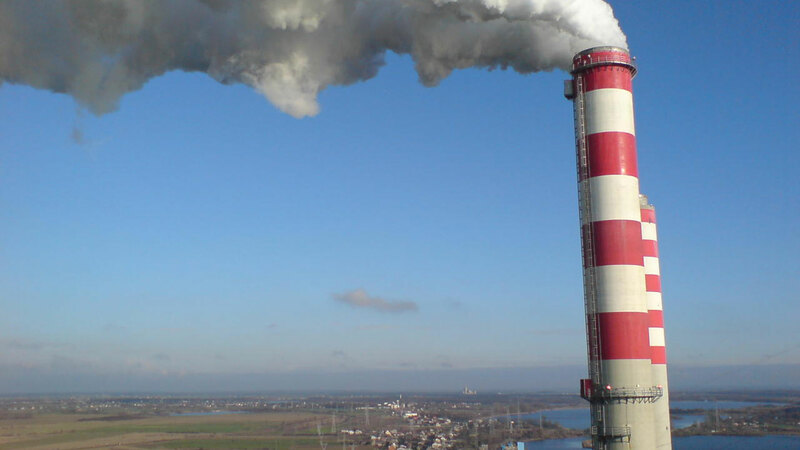 It is in all our interests to use the political, legislative, and social means at our disposal to deliver an achievable transition to a zero-carbon economy based on renewable energy and keep temperature rises to below 1.5 degrees Celsius, especially in light of the most recent dramatic report from the Intergovernmental Panel on Climate Change. 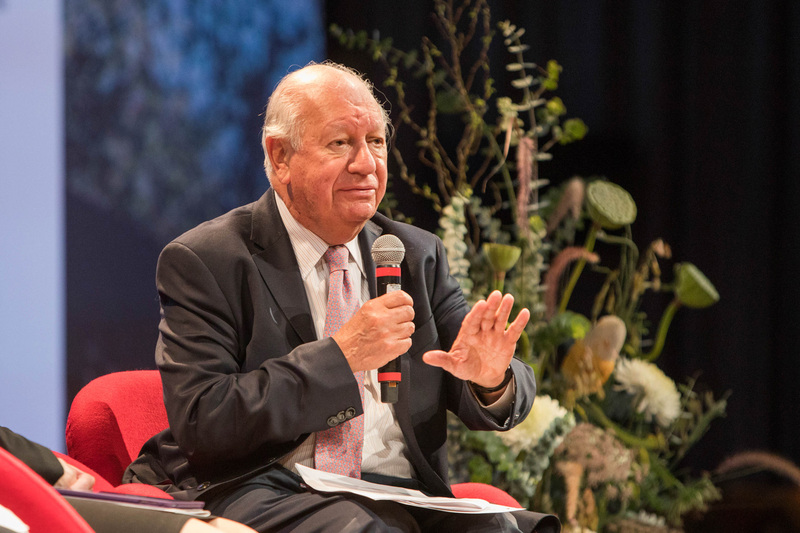 At its heart, climate change is a matter of justice and human rights, and any sustainable and effective response must have these concepts embedded into its policies. The world cannot afford for disruptive technological innovation simply to further reinforce or replicate existing models of economic and political inequality – as has, I fear, been the case to a certain extent with the growth of the internet and its attendant industrial giants in Silicon Valley and across the globe. Nor can the world ignore the profound moral and human rights implications of new technologies such as artificial intelligence and robotics being used in a military context. 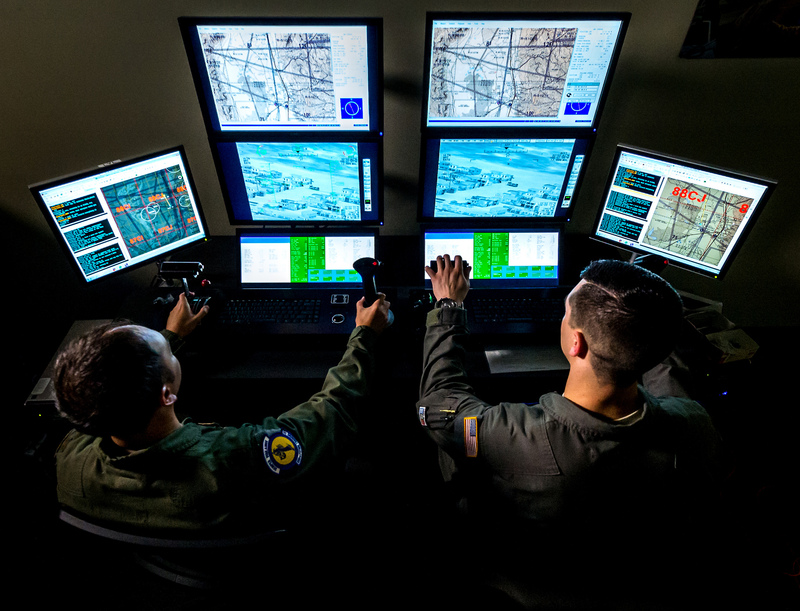 How do the Geneva Conventions and the wider rules of war apply to robots, drones and fully-automated weapons systems? The technology may be disruptive, but their impact threatens to be dangerously destructive. “Move fast and break things”, the memorable phrase attributed to Facebook founder Mark Zuckerberg, vividly sums up the more literal sense of the disruptive spirit behind the internet and social media technology boom of recent years. But in today’s fractured and fractious cultural and political landscape, we should reflect that one of the most precious things that can be broken when technology moves too fast and without sufficient oversight is: trust itself. There is a growing body of evidence that platforms such as Facebook have been used by malign actors to disrupt democratic elections worldwide, through the spread of deliberate disinformation or misuse of personal data. Such abuses have not only taken place in developing countries with fragile civic and political infrastructure but some of the most established democracies in the world: for example the US Presidential election in 2016, and the United Kingdom’s referendum on leaving the European Union in the same year. The way Facebook and other social media platforms collect, store and share data has profound implications for the very concept of privacy and individual rights. At the same time, through the more secretive world of spyware, some of the world’s authoritarian governments have gained the ability to hack the personal phones and computers of those they see as dissidents – anywhere in the world. And this is not just secretive, of course; China’s system is quite out in the open! Social media platforms have an urgent responsibility to reform and strengthen their internal procedures and regulations to do more to protect users’ rights, and prevent the spread of so-called “fake news” and hate speech. Balancing the imperatives of free speech and civic responsibility is a debate that has run for centuries, from Voltaire and Rousseau to Jean-Paul Sartre and Albert Camus, and remains an acute question in today’s digital age. Governments and ordinary citizens must be active participants in this debate. We all have a responsibility, on a personal and collective basis, to uphold basic standards of decency and honesty in public discourse, whether on- or offline. In the absence of such a shift, trust will remain broken: between technology and its users, between media and society, and between the people and their rulers. Such a situation will only benefit those who engage in the politics of division, nationalism, xenophobia and cynical self-interest. It will impede if not derail the collective efforts we urgently need to tackle the existential threats facing our planet: climate change, nuclear proliferation, pandemics and disease. 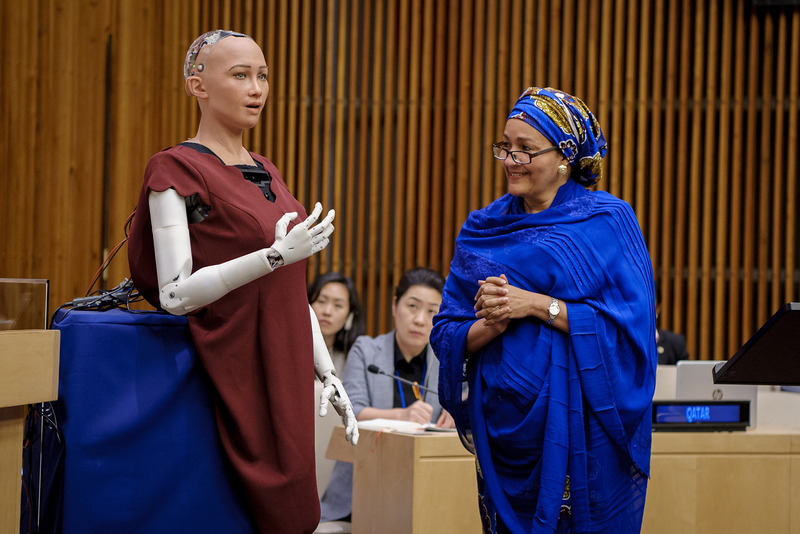 Moreover, it will make it harder to address in a meaningful way the profound moral debates posed by innovative and disruptive technologies such as artificial intelligence and robotics, and the implications of their use on human rights, security and dignity. You students and young leaders in the hall here today already face a very different world of work to the one I grew up with. If technology can be harnessed to make human beings more productive, creative, and better at fulfilling their potential, it will vastly improve standards of living around the world. But this will require policy action at a government and intergovernmental level to ensure that education systems prepare young people to adapt to new technologies – and that social safety nets are there for those whose jobs may become obsolete. How to develop, encourage and harness disruptive new technologies for the benefit of all humanity is one of the defining questions of our age. It requires a collective, inclusive effort across the generations, listening to the voices of young people who are “digital natives”, but also drawing on the experiences of those of us who came of age in the “analogue world” but who recognise that power structures and psychologies persist and adapt to new contexts – for better or worse. 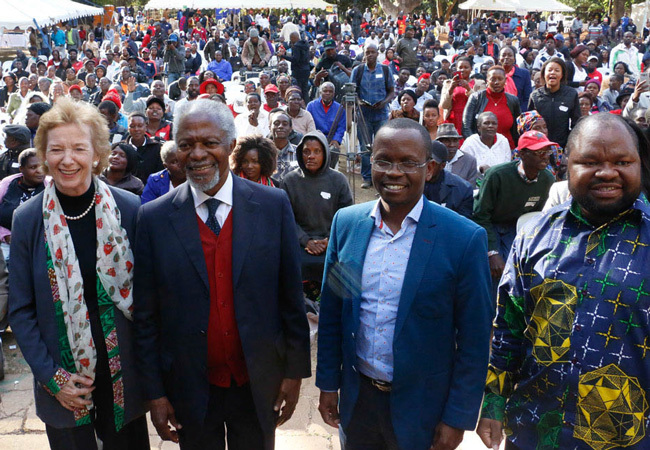 This is why I am delighted that, just last week, the Kofi Annan Foundation launched a new initiative at Stanford University in California, precisely to stimulate debate and address some of these questions. 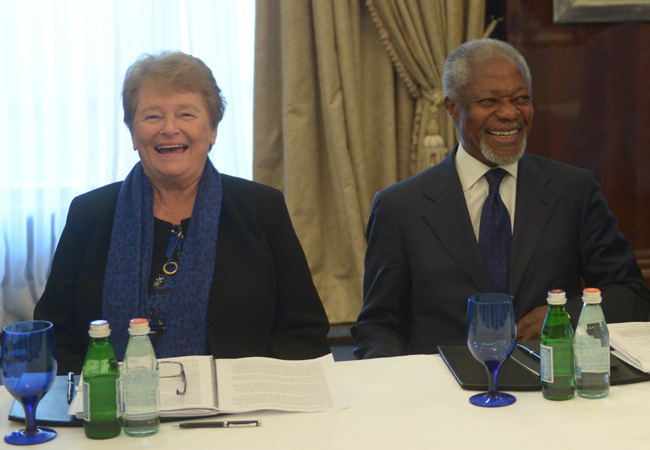 The Kofi Annan Commission on Elections and Democracy in the Digital Age will identify and frame the challenges to electoral integrity arising from digital technologies and social media platforms, drawing together experts from industry, politics, international organisations and civil society. It was Kofi’s last major policy initiative for his Foundation before his untimely death last August , and it shows how, right up to the end, he was facing the future and working to address challenges that would not only impact on today’s world but generations to come. I hope a similar spirit will direct our discussions today, so we can be disruptive in a positive sense and ensure that the undoubted benefits of technological innovation across all spheres can be enjoyed in full by everyone.